Chalk up another win for our President. Just a few weeks ago he was pilloried by the left, lap dog press for criticizing NFL players’ disrespect of the nation’s flag and national anthem. A common word in all the criticism was “divisive.” It was divisive, according to the critics, because the first players to refuse to honor the symbols of our homeland were black. Presumably, if the leaders of the disrespect had been white, our President would have been thanked for calling the offenders to task. Even the NFL hierarchy joined the chorus of condemnation of our President. So those tag alongs of the left were surprised to find that a substantial number of their fans and supporters agreed with our President instead of them. Attendance in person and via TV fell to the extent that there had to be some fast back tracking. Now the NFL is urging the players on its fields to be nice and honor our flag and anthem like all other patriotic Americans. 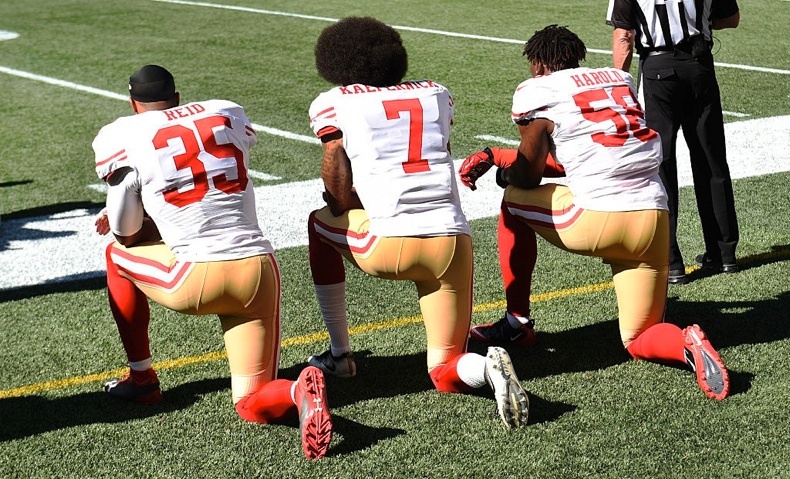 The obscene (in my opinion) and juvenile kneeling on one knee, which is not a traditional praying kneel, was supposed to be a protest of the racism in the country. Without question, racism is rife in the country. Unfortunately, efforts to eliminate that plague seem to have been set back 25 years or so during President Obama’s eight years in the White House. There is no way, however, that protests on nationally televised sports events will improve the situation. Actually, such demonstrations will probably worsen the racism. There also is no way that I or any white person can feel how a black man or woman feels when confronted with a belligerent white official or individual. It has to be terribly frightening and uncomfortable. Whites have never been pulled over by a policeman for DWB—driving while black. Nor are we pummeled daily with false allegations that the only unarmed people killed by police are blacks. These are just two of the circumstances that may keep black people constantly aware of the prevailing racism. Only very slow witted whites and others do not recognize or appreciate this malady. Obviously the problem is not whether racism exists but what can be done to reduce or eradicate it. One thing that definitely will not work as a cure is to have prominent blacks publicly display disrespect for the flag and anthem that flew and wafted over the millions of men and women giving their lives so that all Americans could live in freedom. That disrespect has the exact opposite effect from what was intended or hoped for. It will add to the ranks of those who already think the police are justified in stopping traffic for DWB offenders. The juvenile displays of disrespect are as ineffective for turning racism on its head as were the recent demonstrations in St. Louis, Missouri. Those were the demonstrations and protests for a number of days over the acquittal of a white police officer charged with killing a black man. How could any conduct overturn a final verdict in any trial? What did the demonstrators want or expect? What they got was more metastasizing of the racism malignancy. Dropping to one knee while the national anthem is played and tying up traffic over a jury verdict are justified as exercises of our free speech guarantees. Criticism of that free speech is also protected by the same provision of the constitution. So it is incongruous to praise athletes for disrespecting the flag but to criticize our President for objecting to such conduct. Those protesting racism by proclaiming that it exists might serve their cause better by a little introspection. Look to see if maybe there is conduct on both sides of this issue that is a contributing factor to the growing divide. In other words, is there something other than protesting to lower the rhetoric and lead to a reversal of racism’s downward spiral? Maybe our President started that introspection when he protested the dishonor allowed on the playing fields of the NFL.